The classic flavor of apples and cinnamon are joined by orange and vanilla in a rich, buttery Danish pastry. 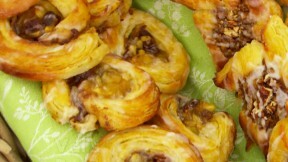 This apple, sultana and cinnamon swirls recipe is featured in Season 4, Episode 5. For the pastry dough, put the flour, salt and sugar on one side of a large mixing bowl and the yeast on the opposite side. Add the eggs, warm milk and 1¾fl oz water and mix for one minute using a fork until combined. Add a little more water if needed to form a soft dough. Dust a work surface with flour and turn out the dough. Dust with a little flour and knead for 5 minutes, then shape into a ball. Lightly oil a mixing bowl and a large piece of cling film. Put the dough in the bowl and cover with the cling film. Set aside in a warm place to prove for an hour, or until almost doubled in size. For the filling, beat the butter and 4oz of the sugar in a mixing bowl. Stir in the cinnamon and set aside. Put the apples in a saucepan and add the remaining sugar. Cook over a medium heat for about 10 minutes, stirring regularly, until the apples begin to break down. Add the sultanas, orange juice, orange zest, and lemon zest. Heat gently for 5 minutes then set aside to cool. When cold, stir in the vanilla extract. For the glaze, combine the apricot conserve and lemon juice with 2 tablespoons water in a heavy-based saucepan. Slowly bring to the boil, (don’t stir it too much or bubbles will form and the glaze will appear cloudy), transfer the glaze to a heatproof bowl and place over a pan of gently simmering water until the glaze is runny. Pass through a sieve then return to the pan and set aside. To finish the pastry, roll out the dough on a lightly floured work surface until ½in thick. Beat the chilled butter using a rolling pin, until it is flattened into a rectangle roughly half the size of the dough rectangle. Arrange the dough with a short edge nearest you and put the butter in the middle. Fold the top and bottom of the pastry over the butter and press down the edges to ensure the butter is sealed within the pastry. Using a rolling pin, tap the dough from the middle upwards and from the middle downwards. This ensures that the butter is evenly distributed. Roll out the pastry to a large rectangle approximately ½in thick. Turn dough so you have a long edge nearest you, then fold the right third into the middle and cover with the left third. Chill in the fridge for 30 minutes. Do this turning, folding and chilling two more times. Preheat the oven to 390F. Line two large baking trays with non-stick baking paper. To assemble the pastries, roll the pastry out into a rectangle about 10x8in and ½in thick. Spread with the cinnamon and butter mixture leaving about ¾in of dough free from the mixture on the side nearest to you. Roll up the dough towards you. Brush the last bit of dough with a little egg wash to help it stick. Cut away the scruffy ends then slice the roll into 12 even pieces with a sharp knife. Place the pastries on the prepared trays, allowing plenty of room around each one. Lightly flour your hands and flatten each slice slightly, making a small indent in the middle. Spoon 1 teaspoon of the apple mixture into the centre of each pastry. Cover with a clean tea towel or plastic bag and set aside in a warm place for 10 minutes. Brush with egg wash and then bake for 15–20 minutes, or until crisp and golden-brown. Place the cooked pastries on cooling racks and brush them with apricot glaze while they are still hot. Leave to cool completely. Meanwhile, mix all the icing ingredients together until smooth. Transfer to a paper piping bag and pipe lines across the pastry to finish. For this recipe you will need a piping bag fitted with a plain nozzle. Note: This recipe contains U.K. measurements and may require conversions to U.S. measurements. It has also not been professionally tested.